On Modern Family, Season 9, Episode 14, Jay and Gloria are caught in a miscommunication about spanking. Jay ends up on the spanked side. On Modern Family, Season 9, Episode 14, Phil is giving Alex some advice about enjoying her life instead of always taking the hard road. On Modern Family, Season 9, Episode 14, Phil and Claire are trying something new in the bedroom. Claire's fine with it, if Phil doesn't talk. 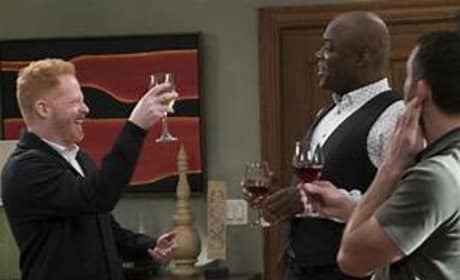 On Modern Family, Season 9 Episode 14, Mitch and Cam throw a party for Mitch to brag about his new well-paying job. 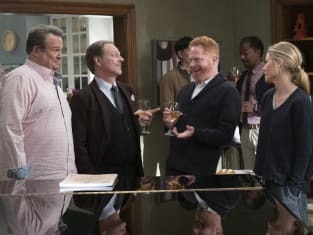 Mitch and Cam throw a party to try and abolish getting a look of pity from their friends on Modern Family. "Spanks For The Memories" is the 14th episode of the show's ninth season.